REALTREE™ APG CAMO EXTERIOR: A perfect complement to all your outdoor adventures, the Realtree™ APG camo exterior is designed to blend into any environment. POWER FOR MICROWAVE, REFRIGERATORS, HAIR DRYER, SMALL AC UNITS, AND MUCH MORE: This popular model can operate a wide variety of small appliances. 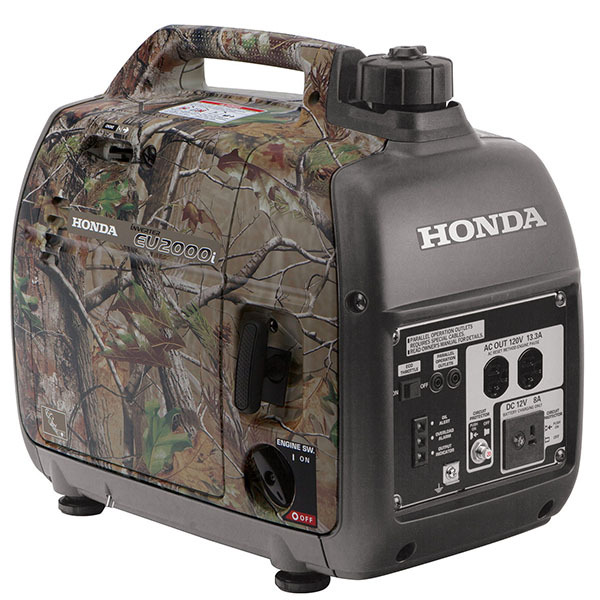 LIGHTWEIGHT AND COMPACT: Weighing less than 46 pounds, the EU2000i is incredibly lightweight and portable, thanks to Honda's inverter technology. FUEL EFFICIENT - RUNS UP TO 8.1 HRS ON LESS THAN A GALLON OF FUEL: Thanks to our exclusive Eco-Throttle System, the EU2000i offers great fuel efficiency. Runs 3.4 to 8.1 hours on a single tank, depending on the load. This makes it great for overnight power.